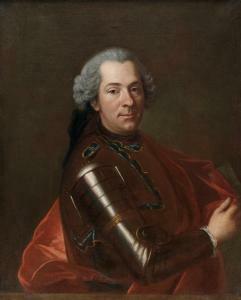 Find artworks, auction results, sale prices and pictures of Louis De Fontaine at auctions worldwide. E. Benezit, Dictionnaire Critique et Documentaire des Peintres, Sculpteurs, Dessinatuers et Graveurs, Paris 1976, vol.4, p. 422. 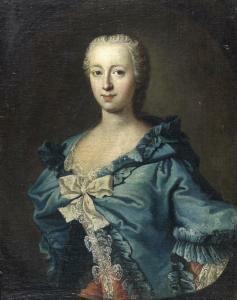 Possibly G.F. Schmidt, presumably after 1724. The French actress Adrienne Lecouvreur was born on the 5th April 1692 at Damery, not far from Rheims, the daughter of a hatter. She was brought up by her laundress aunt and an intemperate father. Her success on the stage was at the time attributed to her abandoning the conventional stilted style of delivery for a more naturalistic, emotional intensity. She was received into the Comédie Française in 1717, where she spent thirteen years as the 'Queen of Tragedy' and achieved an enormous popularity. 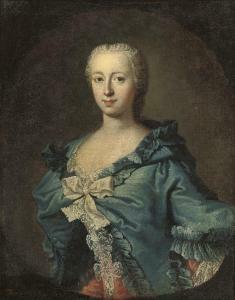 It was her romance with the flamboyantly reckless Marechal de Saxe, whom Adrienne met in 1721 (three years before the present work was executed), that brought about the mysterious and much chronicled events surrounding her death . It is thought she was poisoned by her rival, the Duchesse de Bouillon, dying on the 20th March 1730. The Jesuit priest present on her death bed refused to administer extreme unction unless she declared repentance for her theatrical career . She refused and was denied burial in consecrated ground. Voltaire voiced his indignation in a poem at this treatment of the woman who was said to have played no fewer than 1,184 times in a hundred roles, of which she created twenty-two. Her life became the inspiration for the tragedy by Eugene Scribe and Enest Legouve (1849). 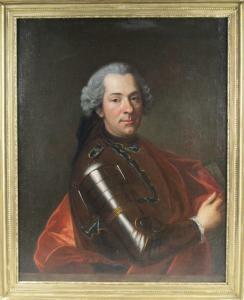 Although few works by the artist are known, in addition to a painting in the Musée d' Orléans of an abbess, a supposed portrait of the Dauphin of France (1729-1765) by Louis de Fontaine was sold at Christie's on 25th May 1950, lot 32, for 45 gns.